Commonly referred to as a tummy tuck, this procedure removes the excess skin and fat from the lower abdomen and re-drapes the upper abdominal skin for a sleeker more taught abdomen. The scar typically extends from hip to hip in the bikini line as well as having a scar around the belly button (umbilicus). Internally, the separation between the rectus muscles (a diastasis), which frequently occurs following pregnancy or weight gain, is tightened using a corset type of stitch. This restores the abdominal muscle structure and may improve posture, strength and function. Occasionally, liposuction is also added to this procedure to improve contours of the hip and pubic area. Risks of the procedure include bleeding, infection, wound healing problems, and blood clots (DVT). The risk of blood clots in the legs, such as might happen during long plane rides and periods of immobility make it important to be up moving around the same day of surgery. The first few nights it is a good idea to have prepared a place for sleeping that will keep you comfortable in a beach chair type of position. A lazy-boy recliner is a good example. If you don’t have this available make sure to place extra pillows below your knees and head area as you will not be comfortable lying down flat. It is also a good idea to walk with a hunched-over position for the first few days until you can comfortably stand up straight. Drains will be in place in the abdomen, they will be removed when they are draining a minimal amount. Be sure to take enough pain medication to keep yourself comfortable. It is important to be comfortable enough to take deep breaths and cough regularly to prevent complications from lung collapse, such as pneumonia, after surgery. Recovery time is 4-6 weeks although some people may return to work after 2 weeks. It is important to avoid heavy lifting for 4-6 weeks after surgery to allow for the muscle healing. You may also be asked to wear an abdominal binder for this period of time. Final result is seen by about 3 months but scars will continue to fade and soften over the course of the year. Post gastric bypass with 120lb weight loss was then treated with fleur de lis abdominoplasty and removal of 3260g of tissue. 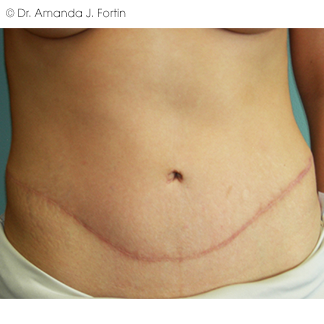 Post gastric bypass surgery underwent fleur de lis abdominoplasty with removal of 9477g of tissue. Pre-op had history of nearly 200 lb weight loss; had 1640g of tissue removed. 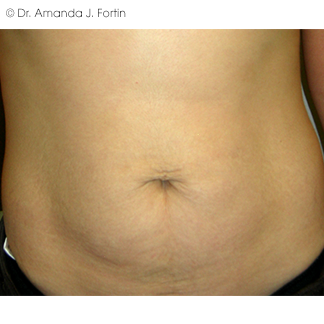 With standard abdominoplasty for 833g. 40 lb weight loss, had standard abdominoplasty with removal of 978g. With 280 lb weight loss following gastric bypass surgery was treated with a fleur de lis abdominoplasty for removal of 1154g of tissue.